A full-size model of ERS 2, an Earth observation satellite. In the context of spaceflight, a satellite is an object that has been placed into orbit by human endeavor. Such objects are sometimes called artificial satellites to distinguish them from natural satellites such as the Moon. Satellites are useful for a number of purposes. They are used for communications, navigation, map-making, astronomical observations, scientific experimentation, and monitoring of the Earth's environment and weather conditions. Some satellites with military missions may conduct espionage or carry weapons to destroy enemy warheads and satellites. The first fictional depiction of a satellite being launched into orbit is a short story by Edward Everett Hale, The Brick Moon. The story was serialized in The Atlantic Monthly, starting in 1869. The idea surfaces again in Jules Verne's The Begum's Millions (1879). In 1903, Konstantin Tsiolkovsky (1857–1935) published Исследование мировых пространств реактивными приборами (The Exploration of Cosmic Space by Means of Reaction Devices), which was the first academic treatise on the use of rocketry to launch spacecraft. He calculated the orbital speed required for a minimal orbit around the Earth at 8 km/s, and that a multi-stage rocket fueled by liquid propellants could be used to achieve this. He proposed the use of liquid hydrogen and liquid oxygen, though other combinations could be used. In 1928, Herman Potočnik (1892–1929) published his sole book, Das Problem der Befahrung des Weltraums - der Raketen-Motor (The Problem of Space Travel—The Rocket Motor), a plan for a breakthrough into space and a permanent human presence there. He conceived of a space station in detail and calculated its geostationary orbit. He described the use of orbiting spacecraft for detailed peaceful and military observation of the ground and described how the special conditions of space could be useful for scientific experiments. The book described geostationary satellites (first put forward by Tsiolkovsky) and discussed communication between them and the ground using radio, but fell short of the idea of using satellites for mass broadcasting and as telecommunications relays. In a 1945 Wireless World article, the English science fiction writer Arthur C. Clarke (1917-2008) described in detail the possible use of communications satellites for mass communications. Clarke examined the logistics of satellite launch, possible orbits, and other aspects of the creation of a network of world-circling satellites, pointing to the benefits of high-speed global communications. He also suggested that three geostationary satellites would provide coverage over the entire planet. The first artificial satellite was Sputnik 1, launched by the Soviet Union on October 4, 1957, and that started the whole Soviet Sputnik program, with Sergei Korolev as chief designer. This triggered the Space Race between the Soviet Union and the United States. Sputnik 1 helped to identify the density of high atmospheric layers through measurement of its orbital change and provided data on radio-signal distribution in the ionosphere. Because the satellite's body was filled with pressurized nitrogen, Sputnik 1 also provided the first opportunity for meteoroid detection, as a loss of internal pressure due to meteoroid penetration of the outer surface would have been evident in the temperature data sent back to Earth. The unanticipated announcement of Sputnik 1's success precipitated the Sputnik crisis in the United States and ignited the so-called Space Race within the Cold War. Sputnik 2 was launched on November 3, 1957 and carried the first live passenger into orbit, a dog named Laika. In May, 1946, Project RAND had released the Preliminary Design of an Experimental World-Circling Spaceship, which stated, "A satellite vehicle with appropriate instrumentation can be expected to be one of the most potent scientific tools of the Twentieth Century. The United States had been considering launching orbital satellites since 1945 under the Bureau of Aeronautics of the United States Navy. The United States Air Force's Project RAND eventually released the above report, but did not believe that the satellite was a potential military weapon; rather, they considered it to be a tool for science, politics, and propaganda. Following pressure by the American Rocket Society, the National Science Foundation, and the International Geophysical Year, military interest picked up and in early 1955 the Air Force and Navy were working on Project Orbiter, which involved using a Jupiter C rocket to launch a satellite. The project succeeded, and Explorer 1 became the United States' first satellite on January 31, 1958. Anti-Satellite weapons/"Killer Satellites" are satellites that are armed, designed to take out enemy warheads, satellites, other space assets. Communications satellites are satellites stationed in space for the purpose of telecommunications. Modern communications satellites typically use geosynchronous orbits, Molniya orbits, or Low Earth orbits. Miniaturized satellites are satellites of unusually low weights and small sizes. New classifications are used to categorize these satellites: minisatellite (500–200 kg), microsatellite (below 200 kg), nanosatellite (below 10 kg). Reconnaissance satellites are Earth observation satellite or communications satellite deployed for military or intelligence applications. Little is known about the full power of these satellites, as governments who operate them usually keep information pertaining to their reconnaissance satellites classified. Space stations are man-made structures that are designed for human beings to live on in outer space. A space station is distinguished from other manned spacecraft by its lack of major propulsion or landing facilities—instead, other vehicles are used as transport to and from the station. Space stations are designed for medium-term living in orbit, for periods of weeks, months, or even years. The first satellite, Sputnik 1, was put into orbit around Earth and was therefore in geocentric orbit. By far this is the most common type of orbit with approximately 2456 artificial satellites orbiting the Earth. Geocentric orbits may be further classified by their altitude, inclination and eccentricity. The commonly used altitude classifications are Low Earth Orbit (LEO), Medium Earth Orbit (MEO) and High Earth Orbit (HEO). Low Earth orbit is any orbit below 2000 km, and Medium Earth Orbit is any orbit higher than that but still below the altitude for geosynchronous orbit at 35786 km. High Earth Orbit is any orbit higher than the altitude for geosynchronous orbit. Galactocentric orbit: An orbit about the center of a galaxy. Earth's sun follows this type of orbit about the galactic center of the Milky Way. Geocentric orbit: An orbit around the planet Earth, such as the Moon or artificial satellites. Currently there are approximately 2465 artificial satellites orbiting the Earth. Areocentric orbit: An orbit around the planet Mars, such as moons or artificial satellites. Hohmann transfer orbit: An orbital maneuver that moves a spacecraft from one circular orbit to another using two engine impulses. This maneuver was named after Walter Hohmann. Molniya orbit: A highly elliptic orbit with inclination of 63.4° and orbital period of half of a sidereal day (roughly 12 hours). Such a satellite spends most of its time over a designated area of the planet. Tundra orbit: A highly elliptic orbit with inclination of 63.4° and orbital period of one sidereal day (roughly 24 hours). Such a satellite spends most of its time over a designated area of the planet. 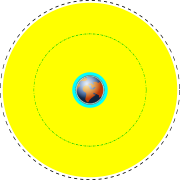 Hyperbolic orbit: An orbit with the eccentricity greater than 1. Such an orbit also has a velocity in excess of the escape velocity and as such, will escape the gravitational pull of the planet and continue to travel infinitely. Parabolic orbit: An orbit with the eccentricity equal to 1. Such an orbit also has a velocity equal to the escape velocity and therefore will escape the gravitational pull of the planet and travel until its velocity relative to the planet is 0. If the speed of such an orbit is increased it will become a hyperbolic orbit. Escape orbit (EO): A high-speed parabolic orbit where the object has escape velocity and is moving away from the planet. Capture orbit: A high-speed parabolic orbit where the object has escape velocity and is moving toward the planet. Geosynchronous orbit (GEO): Orbits with an altitude of approximately 35786 km (22240 miles). Such a satellite would trace an analemma (figure 8) in the sky. Geostationary orbit (GSO): A geosynchronous orbit with an inclination of zero. To an observer on the ground this satellite would appear as a fixed point in the sky. Areosynchronous orbit: A synchronous orbit around the planet Mars with an orbital period equal in length to Mars' sidereal day, 24,6229 hours. Areostationary orbit (ASO): A circular areosynchronous orbit on the equatorial plane and about 17000 km(10557 miles) above the surface. To an observer on the ground this satellite would appear as a fixed point in the sky. Heliosynchronous orbit: An heliocentric orbit about the Sun where the satellite's orbital period matches the Sun's period of rotation. These orbits occur at a radius of 24,360 Gm (0,1628 AU) around the Sun, a little less than half of the orbital radius of Mercury. Sun-synchronous orbit: An orbit which combines altitude and inclination in such a way that the satellite passes over any given point of the planets's surface at the same local solar time. Such an orbit can place a satellite in constant sunlight and is useful for imaging, spy, and weather satellites. Moon orbit: The orbital characteristics of earth's moon. Average altitude of 384403 kilometers (238857 mi), elliptical-inclined orbit. The satellite’s functional versatility is imbedded within its technical components and its operations characteristics. Looking at the “anatomy” of a typical satellite, one discovers two modules. Note that some novel architectural concepts such as Fractionated Spacecraft somewhat upset this taxonomy. The structural subsystem provides the mechanical base structure, shields the satellite from extreme temperature changes and micro-meteorite damage, and controls the satellite’s spin functions. The telemetry subsystem monitors the on-board equipment operations, transmits equipment operation data to the earth control station, and receives the earth control station’s commands to perform equipment operation adjustments. The power subsystem consists of solar panels and backup batteries that generate power when the satellite passes into the earth’s shadow. The attitude and orbit controlled subsystem consists of small rocket thrusters that keep the satellite in the correct orbital position and keep antennas positioning in the right directions. Launch of the first British Skynet military satellite. This list includes countries with an independent capability to place satellites in orbit, including production of the necessary launch vehicle. Note: many more countries have the capability to design and build satellites—which relatively speaking, does not require much economic, scientific and industrial capacity—but are unable to launch them, instead relying on foreign launch services. This list does not consider those numerous countries, but only lists those capable of launching satellites indigenously, and the date this capability was first demonstrated. Does not include consortium satellites or multi-national satellites. Both North Korea (1998) and Iraq (1989) have claimed orbital launches (satellite and warhead accordingly), but these claims are unconfirmed. In addition to the above, countries such as South Africa, Spain, Italy, West Germany, Canada, Australia, Argentina, Egypt and private companies such as OTRAG, have developed their own launchers, but have not had a successful launch. Several other countries are at various stages of development of their own small-scale launcher capabilities, and seek membership in the club of space powers. It is scheduled that in early 2008 South Korea will launch a KSLV rocket (created with assistance of Russia) and become the next space power. Iran already has successfully tested its own space launch vehicle (Kavoshgar 1) and is scheduled to put its first domestic satellite (Omid 1) into orbit within a year from February 4, 2008. It is expected that Brazil and Pakistan will follow in the near future. Poland 1973 Intercosmos Kopernikus 500 ? While Canada was the third country to build a satellite which was launched into space, it was launched aboard a U.S. rocket from a U.S. spaceport. The same goes for Australia, who launched on-board a donated Redstone rocket. 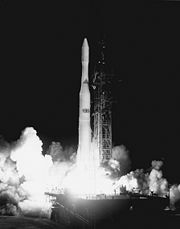 The first Italian-launched was San Marco 1, launched on 15 December, 1964 on a U.S. Scout rocket from Wallops Island. Virginia, USA, with an Italian Launch Team trained by NASA. Australia's launch project, in November 1967, involved a donated U.S. missile and U.S. support staff as well as a joint launch facility with the United Kingdom. Kazakhstan announced its intention to build their satellite independently, but lacking the adequate technology to construct it, the government had to place an order with Russia’s Khrunichev space technology center. Polish and Bulgarian satellites had previously used Russian assistance. Satellites in low earth orbit have been destroyed by ballistic missiles launched from earth. Both Russia and the United States have demonstrated ability to eliminate satellites. In 2007 the Chinese military shot down an ageing weather satellite, followed by the US Navy shooting down a defunct spy satellite in February 2008. Russia and the United States have also shot down satellites during the Cold War. The United States Space Surveillance Network (SSN) has been tracking space objects since 1957 when the Soviets opened the space age with the launch of Sputnik I. Since then, the SSN has tracked more than 26,000 space objects orbiting Earth. The SSN currently tracks more than 8,000 man-made orbiting objects. The rest have re-entered Earth's turbulent atmosphere and disintegrated, or survived re-entry and impacted the Earth. The space objects now orbiting Earth range from satellites weighing several tons to pieces of spent rocket bodies weighing only 10 pounds. About seven percent of the space objects (i.e. about 560 satellites) are operational satellites, the rest are space debris. USSTRATCOM is primarily interested in the active satellites, but also tracks space debris which upon reentry might otherwise be mistaken for incoming missiles. The SSN tracks space objects that are 10 centimeters in diameter (baseball size) or larger. Fixed satellite services handle hundreds of billions of voice, data, and video transmission tasks across all countries and continents between certain points on the earth’s surface. 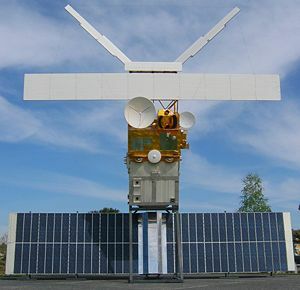 Mobile satellite systems help connect remote regions, vehicles, ships and aircraft to other parts of the world and/or other mobile or stationary communications units, in addition to serving as navigation systems. Scientific research satellites provide us with meteorological information, land survey data (e.g., remote sensing), and other different scientific research applications such as earth science, marine science, and atmospheric research. ↑ The Brick Moon and Other Stories by Edward Everett Hale. Project Gutenberg. Retrieved August 10, 2008. ↑ Contents - The Atlantic monthly. Volume 24, Issue 141. cornell.edu. Retrieved August 10, 2008. ↑ The 1945 Proposal by Arthur C. Clarke for Geostationary Satellite Communications. Lakdiva.org. Retrieved August 10, 2008. ↑ A Brief History of Animals in Space. NASA. Retrieved August 10, 2008. ↑ Preliminary Design of an Experimental World-Circling Spaceship. RAND. Retrieved August 10, 2008. ↑ News Reel - First US Satellite Launched. webcastr.com. Retrieved August 10, 2008. ↑ Earth Observations from Space, The First 50 Years of Scientific Achievements. NASA. Retrieved August 10, 2008. ↑ James Oberg. 1984. Pearl Harbor in space. jamesoberg.com. Retrieved August 10, 2008. ↑ 9.0 9.1 Grant, A. and J. Meadows. 2004. Communication Technology Update, 9th ed. Oxford, UK; Burlington, MA: Focal Press. ISBN 9780240806402. ↑ Badr-B. globalsecurity.org. Retrieved October 24, 2008. ↑ First time in History. tbs-satellite.com. Retrieved August 10, 2008. ↑ SATCAT Boxscore. celestrak.com. Retrieved August 10, 2008. ↑ Canada's Churchill Spaceport. spacetoday.org. Retrieved August 10, 2008. ↑ San Marco 1. NASA. Retrieved August 10, 2008. ↑ WRESAT Australia's First Satellite. powerup.com.au. Retrieved August 10, 2008. ↑ Dan Morrill, 2007. Hack a Satellite while it is in orbit. ittoolbox.com. Retrieved August 10, 2008. ↑ AsiaSat accuses Falungong of hacking satellite signals. Press Trust of India. Retrieved August 10, 2008. ↑ 18.0 18.1 William J. Broad, and David E. Sanger. January 18, 2007. China Tests Anti-Satellite Weapon, Unnerving U.S. New York Times Retrieved August 10, 2008. ↑ Joe Pappalardo, 2008. Navy Missile Successful as Spy Satellite Is Shot Down. Popular Mechanics Retrieved August 10, 2008. ↑ U.S.-Led Forces Destroy GPS Jamming Systems in Iraq. space.com. Retrieved August 10, 2008. ↑ Bob Brewin, 2003. Homemade GPS jammers raise concerns. computerworld.com. Retrieved August 10, 2008. ↑ Iran government jamming exile satellite TV. iranfocus.com. Retrieved August 10, 2008. ↑ Peter de Selding, 2007. Libya Pinpointed as Source of Months-Long Satellite Jamming in 2006. space.com. Retrieved August 10, 2008. ↑ Orbital Debris Education Package. NASA. Retrieved August 10, 2008. Grant, A., and J. Meadows. 2004. Communication Technology Update, 9th ed. Oxford, UK; Burlington, MA: Focal Press. ISBN 9780240806402. Maini, Anil Kumar, and Varsha Agrawal. 2007. Satellite Technology: Principles and Applications. Chichester, UK: John Wiley. ISBN 0470033355. Maral, Gérard, and Michel Bousquet. 2002. Satellite Communications Systems: Systems, Techniques and Technology. Chichester, UK; New York, NY: Wiley. ISBN 0471496545. How Stuff Works.com How satellites work. This page was last modified on 20 August 2015, at 19:19.